I've long been aware of the fact that Julie Andrews took up her pen and began to write children's book and compile treasuries of stories for children but I have yet to actually crack the covers on any of her books. 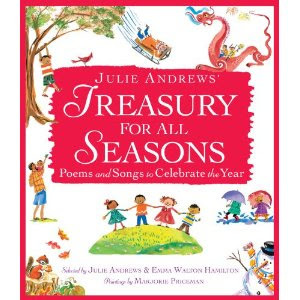 When I was asked if I might like to review a copy of Julie Andrews' Treasury for All Seasons : Poems and Songs to Celebrate the Year I could not say yes fast enough! It arrived and I smiled at it fondly and settled down to browse it all by my lonesome. The book is, as the subtitle states, is a collection of poems and songs which celebrate the year. The idea behind it is one that I like, actually. I think we could celebrate a lot more life than we actually do. Ordinary days can be made extraordinary with just a little bit of effort. But life is also busy and it takes time to prepare celebrations and special treats. When I'm overwhelmed by life, the last thing I am thinking about is pulling out a special tablecloth and/or sitting down to make a card for someone. As a mother of young children, I feel like I'm in survival mode more days that I'd particularly care to be. Alas, celebrations fly right by unnoticed. Therefore I appreciate anyone who comes along and reminds me that life is meant to be enjoyed and celebrated whenever possible. "When my daughter Emma and I began compiling this book, we studied several different calendars to obtain a better understanding of all the holidays we celebrate on our small, diverse planet. It was rather a surprise to discover there were so many more than we had imagined. One year is packed with possibilities for celebration!" Indeed. There are many things to celebrate, from New Years to New Year's Eve. Ground Hog Day, Spring, the first dandelion, going down a hill on a bicycle, baseball games, good hot dogs, Grandpas, pumpkins, Thanksgiving, and Christmas trees are all things to be thoroughly enjoyed. Mrs. Andrews and her daughter also include poems and stories for Sabbath/Shabbat, birthdays, new babies and death (which is a passage that is still marked, if not though of quite so fondly). Almost any life event that you can think of - or any holiday around the world - can be found in this book. "Great lyrics are poems and nothing could please me more than if you, dear reader, upon reading the words, would feel moved to discover the accompanying melody." If she sang each of these poems to me, I'd probably like them a whole lot more. In some ways, my dislike of poetry doesn't really make sense and I realize that. I still can't seem to change the fact that written down, I find poems dull. Songs can reach me. All this to say, don't base your opinion on this book on my non-opinion. I'm just here to tell you that this book exists. And if you think you might like it, look into it. I can't and don't endorse every holiday and belief expressed in these pages. But there are a lot of poems that encourage celebration for things that I love. So! Here you go. A treasury for all seasons for you to enjoy if you like this sort of thing. Thank you, LB for Kids, for sending a copy of this one my way in exchange for my sharing my opinion, however halfhearted it may be. My earliest memory of Christmas music is a Julie Andrews record. It really is too bad that we poetry lovers are so badly outnumbered these days. Sounds interesting. I have never read any of her books. I do like poetry but prefer short and pithy rather than long and rambling. We read a book of hers a few years ago--something about Whangdoodles?? hmmm. . .ah yes, "The Last of the Really Great Whangdoodles". I just finished a YA book(Crossed) that had a good bit of poetry in it. I didn't care for that part at all. Since I adore Julie Andrew's TALENT, I grabbed the Whangdoodle book when I had the chance. It wasn't that long ago that I even realized she was an author. When I was little my Mom bought The Sound of Music for us at Walmart for $10. It was two vhs tapes and we watched it over, and over, and over, and over. And when we were sick we would watch it again! Mary Poppins is currently a favorite with Maggie and Water, as well.